In this editorial, STEMCELL Technologies discusses why continued basic research is required to further our understanding of MSC biology and to fully realize the therapeutic potential of MSCs. Considerable unknowns persist in the field of MSC biology. Continued basic and preclinical research is fundamental to harnessing the therapeutic potential of MSCs and to the success of clinical trials. Mesenchymal stem cell, mesenchymal stromal cell and medicinal signaling cell are just a few of the terms ascribed to MSCs. Debate surrounding the name, biology and functional properties of MSCs persists despite their initial discovery by Friedenstein and colleagues over 30 years ago. Much of the confusion is due to the fact that the vast majority of MSC characterization has been obtained through in vitro assays, which do not reveal the potency or function of these cells in a specific in vivo microenvironment. The ability of in vitro observations to recapitulate the in vivo biology, function and potency of MSCs remains unclear. The current consensus amongst researchers is that MSCs do not meet the stringent biological criteria to be termed “stem cells” and are more accurately described as tissue-resident progenitor cells. MSCs represent a heterogeneous population of cells with variable potentials, particularly when MSCs derived from different tissue sources are compared . The confusion surrounding the definition of MSCs elicited a response from the International Society for Cell Therapy (ISCT), which in 2006 outlined a basic set of criteria that cells must meet to be defined as MSCs . These include adherence to plastic cultureware, the in vitro capacity for trilineage differentiation into osteogenic, adipogenic and chondrogenic lineages, and the expression of a variety of cell-surface markers, none of which are singularly specific for MSCs. Unfortunately, the use of these criteria to qualify “cultured” MSCs may not reflect optimal cell quality or efficacy when transplanted in vivo. Preclinical investigations demonstrating the immunomodulatory capacity of transplanted MSCs and consequent tissue preservation and/or regeneration in a variety of disease and injury models contributed to an increase in the number of translational studies utilizing MSCs. As of May 2018, there are currently over 600 registered clinical trials examining the therapeutic potential of MSCs for a variety of pathologies including multiple sclerosis, rheumatoid arthritis, ALS, graft-versus-host disease (GvHD), myocardial infarction, wound healing and tissue repair (https://clinicaltrials.gov/). Despite the high levels of activity in the clinic, results from translational studies utilizing MSCs are mixed and at best only moderate benefits have been observed . Putting the Clinic Before the Science? Compounding the unknowns surrounding the biology of MSCs are the practical unknowns of how to best apply these cells clinically. The assessment of potency, dose, mode of delivery, post-transfer survival and effect of the in vivo milieu on MSC function are all important aspects for clinical applications that have yet to be optimized. Furthermore, standardized culture conditions that minimize the risk of introducing confounding experimental artifacts is also an important consideration when performing in vitro characterization of MSC functionality and potency. When MSCs are characterized in culture they exist in an adherent state, in contrast to when transplanted, often as single-cell suspensions through intravenous or percutaneous infusions. The loss of adherence and MSC-extracellular matrix interactions has implications on both MSC function and survival that are not fully understood. Therefore, the cell identity and potency of transplanted MSCs is likely different than that of the previously-adherent cells which were originally characterized in vitro. Furthermore, unknown constituents in media formulations that contain animal and/or human-derived materials can influence the functionality of MSCs. A clear example of this is the need to screen for lots of serum in order to establish culture conditions conducive to MSC expansion. Besides affecting expansion capacity, the effects of medium quality on the in vitro phenotype and functionality of MSCs are unclear. The basic understanding of MSC biology, including mechanisms regulating MSC interactions with host cells and the influence of the microenvironment in normal and disease states, are important factors for the successful translation of MSCs to the clinic. The proposed mechanism(s) by which MSCs convey therapeutic benefits has evolved considerably thanks to continued research into the biology and utilization of MSCs in preclinical studies. It is now recognized that the benefits conferred by MSCs are a result of their ability to alter the tissue milieu, rather than serving as tissue progenitor cells. Still, precisely how MSCs function to preserve and enhance tissue regeneration under pathological conditions or following insult/injury has not been fully elucidated. Several mechanisms have been proposed, such as the secretion of trophic and immunomodulatory factors and/or the release of exosomes by MSCs. Despite their transient phase following transplantation (e.g. intravenously administered MSCs become trapped in the lung, die and disappear), MSCs have been shown to be effective in stimulating immunosuppression. A recent study investigating the fate of infused MSCs in a mouse model of graft-versus-host disease (GvHD) suggested that MSCs are actively induced to undergo apoptosis by recipient cytotoxic cells. Consequently, recipient phagocytes engulf the dead MSCs, stimulating their production of indoleamine 2,3-dioxygenase, an enzyme involved in the catabolism of tryptophan which has been identified as being essential to initiating MSC-induced immunosuppression during GvHD . Additionally, Galleu et al  examined patients with GvHD who received MSCs and found that only patients with high cytotoxic activity against MSCs responded to the infusion. Interestingly, this study suggested that the need for recipient cytotoxic cell activity could be replaced by the infusion of dead MSCs generated ex vivo into patients. Continued basic research is required to further our understanding of MSC biology and for the therapeutic potential of MSCs to be fully realized. The valid characterization, functional analysis, assessment of therapeutic potency and optimization of clinical applications requires that MSCs be cultured under conditions that minimize the introduction of experimental artifacts. STEMCELL Technologies provides an optimized workflow that covers the derivation, expansion, passaging and cryopreservation of human MSCs using media formulations devoid of animal-derived components. Figure 1: (A) MesenCult™-ACF Plus Medium supports greater expansion of human bone marrow-derived MSCs compared to other serum-free and xeno-free media tested. 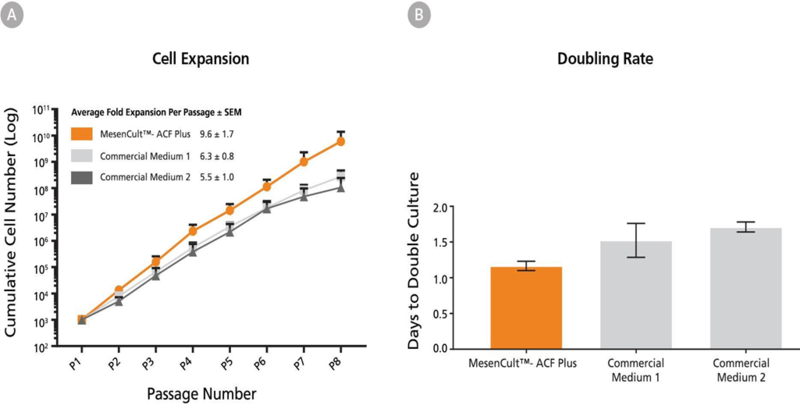 (B) The time required to double the number of MSCs using MesenCult™-ACF Plus Medium was shorter than when cells were cultured in other serum-free and xeno-free media. MSCs can be derived and expanded in an animal component-free medium using MesenCult™-ACF Plus Medium and Culture Kits. Unlike xeno-free and serum-free commercial competitors, bone marrow MSCs can be derived without the addition of human serum. Rigorous QC testing combined with a formulation containing only recombinant proteins improves experimental reproducibility. This medium enables the characterization of MSCs in conditions that are devoid of experimental artifacts introduced by uncharacterized media components, and provides a sustainable medium formulation. Visit our website for more data on the culture of MSCs in MesenCult™ Medium. Expanded MSCs can be passaged and replated without exposure to serum, optimized for the dissociation and passaging of human stem and progenitor cells. Figure 2: MSCs expanded in MesenCult™-ACF Plus and cryopreserved in MesenCult™-ACF Freezing Medium demonstrate high levels of recovery and viability post-thaw. MesenCult™-ACF medium optimized to maximize MSC recovery following cryopreservation. Once thawed and replated, MSCs exhibit high levels of viability, robust expansion rates, and the capacity for trilineage differentiation.